I have a special treat for you all today - a guest post from PB&Julie's premier LTB Report Interviewee and clean beauty expert Amii Steele! In honor of Breast Cancer Awareness Month, Amii is here to break down the ugly side of beauty and offer helpful tips to help you navigate the "beautycounter" more knowledgeable than ever. Plus, shop Amii's favorite PINK beauty products at the end for which she'll generously donate all proceeds to the Breast Cancer Fund - the only breast cancer nonprofit that focuses on prevention of breast cancer rather than awareness. I hope you enjoy the post! There are more than 85,000 chemicals on the market, with thousands being added each year. 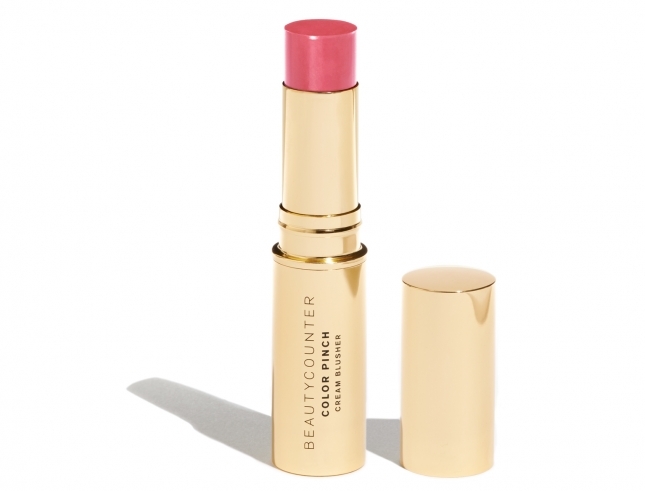 Beautycounter's "never list." Safe products are beautiful. Choose safe personal care products: Use the Environmental Working Group's Skin Deep Database to find easy-to-navigate safety ratings for a wide range of products and ingredients on the market. Keep in mind companies have to disclose all of their ingredients to be listed in the database. There's also an app that you can download. Avoid "fragrance": Although it's just one little word on the ingredient label, "fragrance" can contain dozens, even hundreds, of chemicals—including hormone-disrupting phthalates and synthetic musks. Fragrance manufacturers claim the formulas are confidential business information, and sometimes even keep them secret from the companies that sell their products. Even fragrances that purport to be natural can contain chemicals of concern, so choose products that disclose every ingredient. Keep it simple: Choose companies that have done the homework for you. At Beautycounter we believe we have the strictest ingredient screening process in the industry. We have banned 1,500 ingredients which we will never use. Peony Lip Gloss is moisturizing and goes on smoothly—with no stickiness. Hibiscus Color Pinch Cream Blusher brightens cheeks with natural, dewy color. Petal Lip Sheer is the perfect mix of sheer color and polished sheen.